Spring has sprung in our neck of the woods. In honor of spring and being happy with the blooming flowers and more sunshine, here are ten things that make me happy right now. 1. Will’s questions and comments – It seems like he says something memorable each day. I try to capture them, but sometimes they are so quick they get lost. 2. Jack running – Jack runs very effortlessly and is extremely quick. It is his secret weapon. 3. Islay laying quietly in the backyard – This is the dog we know she will become, but it is hard to remember when she is running and jumping on everyone. 4. 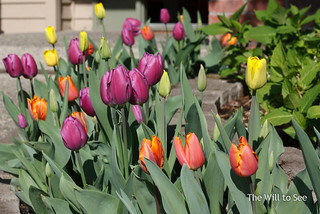 Tulips outside my office – My tulips are blooming in front of the house and I can see them when I am sitting in my office. 5. Hearing the boys laugh at each other – The sound will fill the house as they are playing and enjoying each other’s company. 6. Watching Game of Thrones with Jim – We love watching the show together and speculating about what will happen or figuring out what just did happen. 7. Pulling capri pants to the front of the closet – The appearance of capri pants means summer is just around the corner and it is finally warm enough to wear them. 8. Fruit on Mulligan’s tree – There is small citrus fruit on the tree we bought in honor of Mulligan. I can’t wait for them to ripen. 9. Sun shining on my morning walk – It just brightens my spirits when Islay and I can see the sun on our morning walk. 10. A glass of champagne – I can almost taste the crisp bubbles when I hear the cork pop. Yum! What things make you happy right now?